Twelve boys and their soccer coach who were rescued from a cave in northern Thailand earlier this week remain hospitalized, but are in good spirits and steadily improving, officials said Thursday. 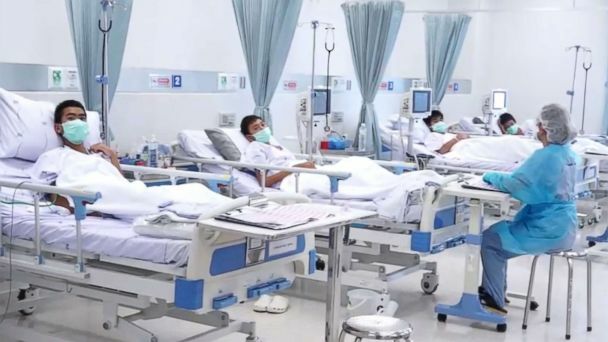 The boys, ages 11 to 16, and their 25-year-old coach were described as generally being in good condition Thursday while they recuperate at a hospital in Chiang Rai province. The group must finish their seven-day course of antibiotics, according to a statement from Jedsada Chokdumrongsuk, permanent secretary at Thailand's Ministry of Public Health. Blood tests results showed no signs of infectious diseases that they might have contracted during their weeks stranded deep within a partly flooded cave near the village of Pong Pha. Doctors are still awaiting the results of laboratory tests for viral infections, Jedsada said. The first four boys to be evacuated Sunday had no fever by Thursday. Two who had minor lung infections were improving. Two of the four boys who were rescued Monday had mild fevers still on Thursday, but their vital signs were normal. Of the four boys and the coach who were evacuated last, on Tuesday, three have fevers and three have ear infections, according to Jedsada. Family members are now permitted to have contact with them while visiting, but must wear hospital gowns and surgical masks, Jedsada said. They were initially kept more than six feet away from the boys and the coach for fear of contagion. The boys and their 25-year-old soccer coach became trapped inside Tham Luang Nang Non, Thailand's longest cave, during a hike June 23. The cave's 6-mile-long labyrinth of chambers and passageways stretch all the way into neighboring Myanmar. It's believed the coach often took the teammates of the Wild Boar youth soccer team into the cave's main entrance in Khun Nam Nang Non Forest Park for fun excursions after practice. After they didn't return from their hike, Thai officials launched an extensive search-and-rescue operation involving well over 1,000 people, including specialists drafted from various nations such as Australia, China, Japan, the United Kingdom and the United States. Persistent rain initially impeded efforts to locate the group. But two British divers found all 13 alive on July 2 in an area a couple of miles from the cave's main entrance. A team of Royal Thai Navy members, a doctor and a nurse stayed with the group, giving them high-powered protein drinks and medical assessments, while rescuers worked on a plan to get them out as safely and quickly as possible. They fought against mother nature to pump out floodwater and divert water flows amid Thailand's wet monsoon season. International dive teams evacuated the boys four at a time over a period of three days this week, racing against time and an impending monsoon rainstorm that threatened to inundate the cave again. The coach was the last to be evacuated. ABC News' Brandon Baur, Joohee Cho, Matt Foster, Ben Gittleson, Matt Gutman, Hugo Leenhardt, James Longman, Kelly McCarthy, Matt McGarry, Gamay Palacios, Kirit Radia, Rex Sakamoto, Scott Shulman, Mike Trew, Anthony Trotter, Sohel Uddin, Marcus Wilford, Karson Yiu and Robert Zepeda contributed to this report.